Leslea Newman adds a third title to her series of animal-themed romps (Cats, Cats, Cats! and Dogs, Dogs, Dogs!) 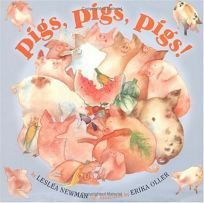 with Pigs, Pigs, Pigs!, illus. by Erika Oller. Here, to welcome the pigs, the townspeople prepare a scrumptious feast of ""Fried green tomatoes and mashed sweet potatoes,/ Troughs full of twice-baked spaghetti./ Cheese tortellini with deep-fried zucchini,/ And buckets of Apple Brown Betty"" plus more; in exchange, the pigs perform.